As I mentioned in my previous post, I enjoyed the street food of Cairo (and of Egypt in general) much more than the restaurant food. I want to point out that this was my personal experience; I’m sure Cairo has some very good restaurants, I just didn’t eat at any of them. My guidebooks said that there are some very good high end restaurants, but that’s not the kind of place I usually eat at when I travel. 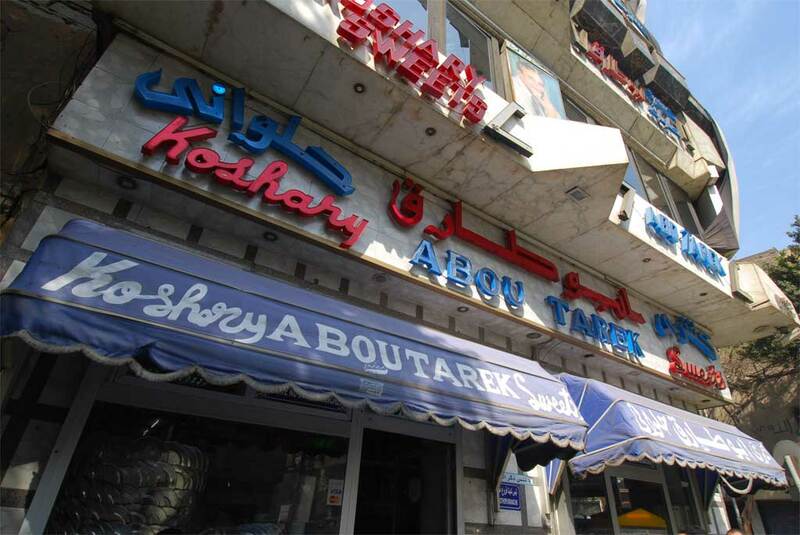 The restaurant I was most looking forward to was Koshary Abou Tarek, the most famous koshary in all of Cairo, and by extension, the world. Even Anthony Bourdain ate there when he went to Egypt. 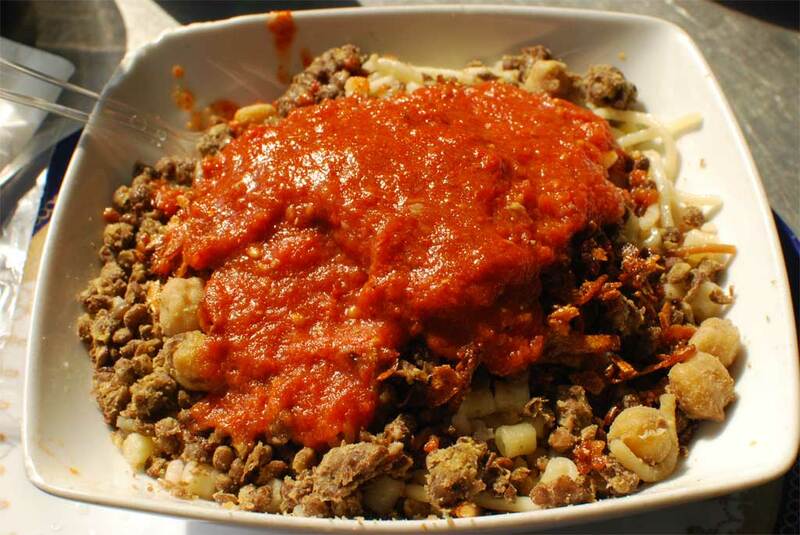 You can get your koshary to stay or to go; I got mine to stay. A large set me back 10 LE (about $2), and came heaped in a bowl with the tomato sauce and fried onions on the side. On the table there were the vinegar and hot sauce, both of which I applied liberally to the bowl. This kosharywas good, but nowhere near as good as the one I’d gotten from a random street vendor the day before. Heresy? Perhaps. It certainly filled me up though, and I needed the energy boost after a long morning ignoring touts at the Pyramids. Just north of Midan Tahrir on Sharia Talaat Harb is a small bake shop called Crystal. I’d passed by it earlier in the day, and the smell almost pulled me inside like a hobo towards a windowsill pie. After eating at Abou Tarek I came back for a post-lunch snack, and for 5 LE ($1) I got these two beauties. In the back is an almost traditional strudel, with apples, raisins, and plenty of cinnamon and sugar. 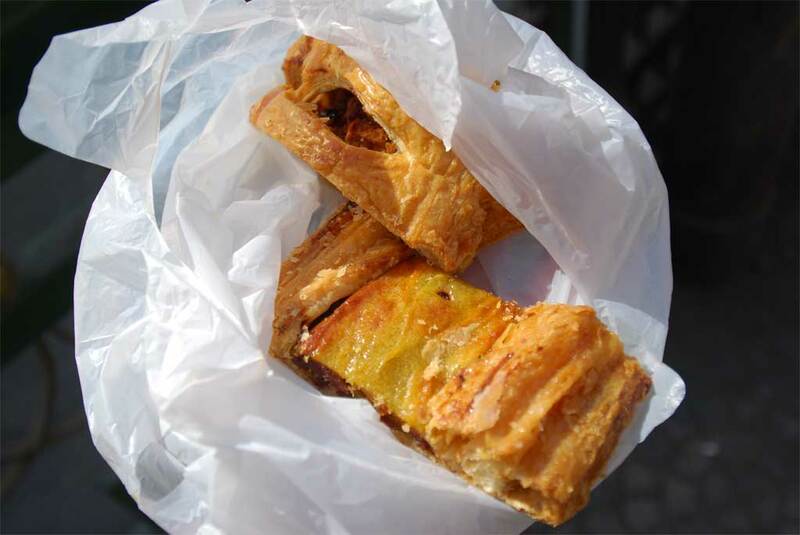 It was good, but overshadowed by the one in the foreground: pastry topped with guava paste which is then topped by a thin slice of banana before being baked. 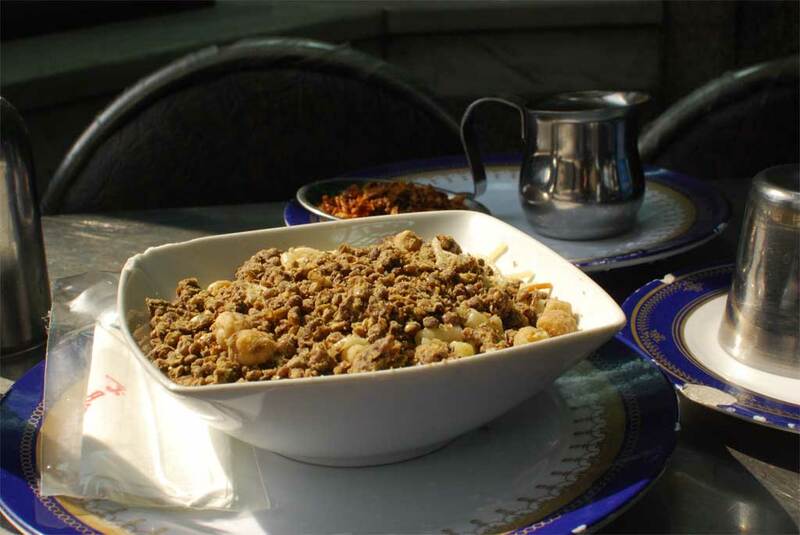 I had dinner that night at Gad, one of Cairo’s most popular restaurant for locals. To get there, just walk north under the 26 July Overpass, which at night is an experience itself. Cairo really comes alive at night, and this road is packed with vendors selling everything from clothes to fresh juices to rear view mirrors for your car. Gad’s lower level is open to the air, and is for takeaway, but upstairs is the table service. Both floors were packed with Cairenes when I arrived, though they found me a seat right away. I started with an acceptable baba ganough, served with fresh, warm, puffy pita bread. Less good was the fiteer, listed on the menu as Egyptian pancake, filled with Greek cheese (I got it on the recommendation of my Lonely Planet guide). The cheese was overly salty and there were also chunks of wan green peppers, onions, and the occasional olive. It was greasy and way too much food. I think, based on what I saw around me, that the restaurant is probably best if you’re sharing with a large group. My whole meal was about 25 LE ($5), and I couldn’t finish it myself. 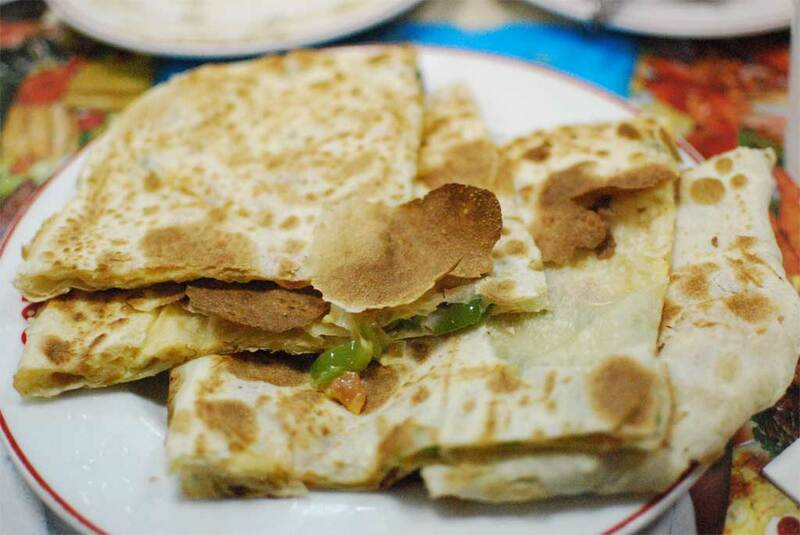 For my final night in Cairo, I decided to head over to the trendy Zamalek neighborhood to try what many people call Cairo’s only vegetarian restaurant: L’Aubergine. It’s funny that they bill themselves as so vegetarian friendly; certainly there is a large vegetarian selection, but there’s plenty of meat on the menu as well. 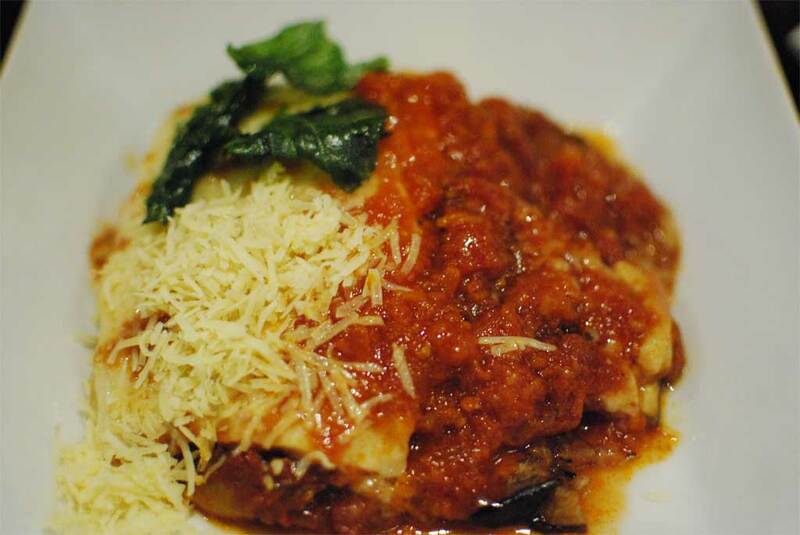 L’Aubergine is a very modern restaurant, with an English language menu and plenty of alcohol available. I got the restaurant’s namesake dish, an aubergine moussaka, at 37 LE (about $7.50) one of the most expensive dishes I’d ordered during the entire trip. It came with a big bread basket, so I guess it was worth the money. Actually, this was pretty good — the eggplant was cooked well and the dish was properly seasoned. For the money I would have liked a bigger portion, but overall it was a pleasant surprise. None of the restaurants in Cairo really impressed me. I don’t doubt that there are some very good ones to be found, and if you know of any feel free to sound off in the comments below. For my money, I’d stick with the street food, though there is something to be said for a real, sit-down meal once in a while.